A few years ago, I received an email from Eva Bloom, a ten-year-old girl, telling me she loved my dolls and was hoping to get one for Christmas. I was melted by the email and wanted very much for her to get one for Xmas too. However, when I scanned the purchases of the three months leading up to the holiday, I was fairly certain her parents were not on there. Three years later, I received an email from the now 13-year-old Eva, asking if I could make a custom doll, an Anne Frank doll, and how much would it cost. Eva wanted to start saving. Eva did not need to save. I wanted nothing more than to make an Anne Frank doll. My oldest daughter had also been obsessed with Anne Frank's story and other similar stories. She had devoured so many young adult books on the Holocaust, that we went to the Holocaust Museum bookstore in Washington DC to find more books. Eva explained her fascination with Anne, "I found interest in Anne Frank while I was reading her book. With a diary like hers, I could really see what it was like during the Holocaust for a girl in hiding. It stuck with me because I felt she was similar to me, when reading her book I felt transported into her everyday life. I read the book one year ago and the play two months ago. I also read two unabridged versions and watched the movie. I would strongly recommend her diary." Anne's clothes fit perfectly within the 1940s clothing set I was designing last November. Read more about the collection here and here. And what could be more sentimental than designing an Anne Frank doll? She was a beautiful girl with an amazing spirit. As I was designing and making Anne, nearly two thousands miles away in a small town in North Dakota, Eva, was working on her sewing skills and Anne Frank's wardrobe. Eva used the patterns and tutorials from my website to create Anne's wardrobe. "I learned how to stitch when I was three years old, but I think I was seven before I started sewing things together. My mom, grandmas from both sides of the family, and our good friend Sara Malles were the ones who taught me. "However, Lisa Is the one who got me to sew more than ever before. Her patterns really got me going. I have been sewing for Anne Frank about 4 months now. I have so many dresses I'm not sure what to do with them all!" In my next post I will have some of Eva's tips for sewing doll clothes and lots of pictures of her amazing clothes. Anne Frank arrived in time for Christmas. And Eva's father captured the moment(s) beautifully. Next post, Anne's beautiful clothes and doll clothes sewing tips from Eva. If ever there was a doll made for tea parties, it is Sharon Rohloff's dolls. They come dressed to sip tea in a beautiful flower garden and talk about their recent trips to art museums and Europe. They are delightful, retro, cheerful and timeless. The bright vintage style fabrics, old fashioned hats and bright hair give the dolls an ethereal charm of early 20th century paintings. her dolls can be found at Pink Ginger Kitty. Sharon has been sewing soft toys for less than two years, but she read a lot, and experimented a lot. "In January 2014, I found a copy of Stuffed magazine by Stampington in a thrift shop. I took it home and devoured every article over a weekend. I was amazed to see so many unique, fun dolls and read about artists thriving as doll makers. 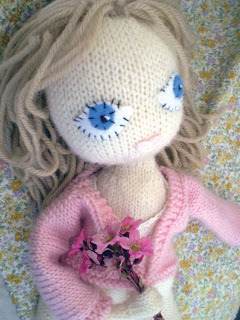 Encouraged by those artists who drew their own patterns, I decided to give doll making a try. I set up my grandma’s 1970’s Singer sewing machine and started playing around with fabric I found at the thrift store. My first toys were a wonky blue donkey and a pink cat with kittens. I was smitten with them and soon sewing all sorts of softies. "My Garden Party Girl dolls came about because I love to mix fabric patterns and I wanted a doll I could build a story around. This doll has a ladylike style reminiscent of the 1920’s. I imagine them all as friends and neighbors that live and interact in the same small village. Their colored yarn hair, patterned dresses and bendable arms and legs was a look that lent itself to endless variations. This was important to me because I get bored without variety." "I am inspired by many things: the seasons, flowers, colors I see in décor magazines, museums and art books, the fashions in PBS series such as Miss Fisher’s Murder Mysteries, and pretty cotton fabrics in fabric stores. "I also love going to thrift stores looking for pretty items that remind me of my grandmother’s home. She was a sewer, a great cook and loved pastel colors. I like finding old notions and ribbons, floral vintage tea tins from England, vintage fabrics such as tablecloths from the ‘40’s and ‘50’s, colorful vintage hankies, toys and children’s books from the ‘50’s – ‘60’s, pretty much anything with colorful graphics. Many of the vintage tablecloths and fabrics that end up at thrift stores have light damage or staining. That makes them perfect for up cycling into doll clothes! Its really fun turning something discarded as old and tired into an elegant, cheerful toy that’s truly one of a kind. Sew two seams all the way around your doll’s body to make a sturdy toy. This anchors arms and legs and helps keep the seams from bursting as you stuff the doll. I also use a second layer of muslin behind the face of my dolls so the knots of my embroidery thread won’t show through. Check your seams on both the front and back of the unstuffed doll to be sure you caught all the layers before turning it right side out. If you are just starting to make doll clothes, break down your clothing ideas into basic shapes. Many pieces can be developed from a “T” or arrow shape. Skirts are often a square or trapezoid, gathered at the top. Lay your doll down on a piece of white drawing paper and trace around it for a body pattern. I use rolls of white paper from the kid’s section of craft stores. You can use the body pattern to draw top and skirt patterns on tracing paper. Once you have a top or skirt pattern you like, cut it apart and make a mockup from inexpensive fabric like muslin or a vintage sheet. You can also try adding variations such as a ribbon tie at the neck, an elastic waist or a ruffle at the bottom edge. On Etsy, on Sharon's blog and by following her on Instagram. Twins. They are fun, adorable, sometimes exhausting, and in most cultures considered lucky. A woman's chance of having twins is less than four percent. So when they come into the world, there is a bit more fanfare and celebration. And if you love to sew little girl clothes, dolls and doll clothes, twin great granddaughters are certainly a reason to celebrate. Vera Catlett is mother to two daughters, and she now has six grandchildren and nine great grandchildren. The most recent additions to her extended family are twin baby girls, Eden and Eliah. They arrived on August 5, weighing five and a half pounds and required a two and a half week hospital stay. Two months later, they are over eight pounds, thriving, and the whole extended family is enjoying them. Especially Vera, who lives two miles away. Not only will she enjoy spending time with Eden and Eliah, but she has already started sewing for them. Vera's mother taught her to sew when she was a teenager, Vera then started sewing clothes for herself. Since then she has continued to make clothes and toys for her growing family. Below is one of Vera's designs modeled by a twin. However, she will soon be sewing on an even smaller scale, she purchased twin Baby Eggs for the twins and will be sewing clothes for both sets of twins, dolls and great granddaughters. One of the twinslooking pretty at five weeks wearing an outfit made by Vera and held by their Mom, Sarah. There are a lot of doll makers I follow and within that group there are a lot of doll-makers who I am impressed by. And then there are the few that completely amaze me. Deborah Fisher is in that amazing category. These two lovelies were the winners of the details category in the SewMamaSew Spectacular Softies contest.. I love everything about them! And not just because the boy doll resembles my husband. Doll making can be about so much more than just making the dolls. First, dolls can bring a sense of comfort to those in need. Doll-making can be about the craft of sewing and creating, or teaching that craft. And doll making can be about using those skills to create employment or a business. Deborah does all of these things. She is a doll-maker who has taken the craft to a whole new level. Deborah uses sewing, specifically dolls and quilts to both comfort and empower. She is the co-founder and director of Bright Hopes Collaborative Quilt Project. Bright Hopes is a non-profit organization that gives quilts to those without the comfort of a permanent home, such as children in foster homes and homeless families. They also offer on-site quilting workshops for people living in shelters and group homes. Deborah did not know how to quilt when she started the collaborative with her mother (who did know how to quilt). Now she can often be found teaching quilting on site. Although Deborah learned quilting as an adult, she has been sewing since she was a child. She loved to sew dolls. "I started sewing dolls when I found a Loretta Daum Byrne pattern in a magazine (probably Needlecraft for Today or something like that). I would make the same doll body over and over and make each one a different costume. "I don't know why it never occurred to me to make one doll with a whole wardrobe of costumes. But it did make for quite a collection of dolls as you can see in the photo below. "There is an Eskimo in the top left, a bride in the top right corner, Artemis and Aphrodite on the bottom shelf, etc. I never made faces on any of them because I didn't have confidence in my ability to do it right. Deborah has more than conquered doll faces. Recently two of her dolls won in the details category the SewMamSew Spectacular Softie contest (photo at the top of this post). And the details are amazing—I am smitten with the shoes and hair. Deborah started a second collaborative, Bo Twal. Bo Twal brings handmade dolls to children internationally. Bo Twal pays women in the community to sew dolls from the Sewing Smiles doll pattern and the dolls are distributed to children in the community. She raises funds for this through the sale of her doll and bunny patterns. Bo Twal is currently working with women in Haiti and soon Indonesia. Lastly, Deborah is the author of the book Sew Fun: 20 Projects for the Whole Family. The projects are all very creative and designed to be enjoyed by children. With each pattern there are suggestions on how children can help with the sewing. As a toy-maker, I love following the art and career paths of other toy makers. I covet glimpses into their studios and creative process. Each of our journeys is unique, yet we also often share similarities, too. My career background is an unusual mix of years as a graphic designer, years of environmental protection and doll-making. An unusual mix, I know. This is why I was especially drawn to Willowynn Textile Arts. Owner Margeaux Davis transforms the beauty of the natural world into cloth toys that are as captivating as the real thing. Her toy collection ranges from the more traditional owls and foxes, to blue and killer whales to species rarely made into toys such as moths, snails and mushrooms. Her depictions of these fauna (and one flora) are sweet but not unrealistically cute. The toys range from soft sculpture for gentle play to bunnies that can withstand the abuse of more intense play. These toys would be perfect for children already interested in wildlife. Or they could be used to spark an interest. Margeaux has been sewing since she was a child, “I have honed my skills through trial, error and persistence. Each design has come about after countless hours spent stitching, unpicking and stitching again.’ When she was a child she made shorts, skirts and drawstring bags for her treasures. Her designs for Willowynn are made out of repurposed materials, linen remnants, second hand fiberfill, cotton napkins, vintage blankets, upholstery remnants, Margeaux is drawn to reuse for environmental reasons and because she enjoys the story and romance of the repurposed materials. Although Margeaux loved her job as a ranger, she created Willowyn so that she could stay home with her two young sons while working with her favorite things--nature and cloth. and in her Etsy Shop. The dolls in the "Knitted Babes" book are so easy and fun to make, you will soon be addicted, which is fine, because there are enough materials in this kit to make at least four. Comment under this post before January 30, 2014. I'll pick a comment from the random number generator. I need to know how to contact you, you can contact me privately. And if you win, this will be coming your way, soon in the mail. The book and materials for the babes clothes. Hair, eyelashes, skin and eyes. Two of my Knitted Babes.